Lake Havasu City is known as Arizona’s Playground. Enjoy the sparkling blue waters next to Arizona’s only lake front community, great golf, shopping, fine dining and so much more. An ideal summer vacation spot, Lake Havasu City is an easy drive from the southwest’s major population centers: Phoenix is just a little more than three hours away, Las Vegas is just 2 ¼ and Los Angeles is only 4 ½. To learn more, log on to www.golakehavasu.com or call 928-453-3444. 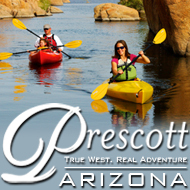 Just south of Lake Havasu, Parker resides along 16 miles of the Colorado River. Perfect for the boating enthusiast, Parker offers some of the best river tubing, water skiing and fishing in the state. And when you’re done with all the water fun, you can pull up to any of the waterfront restaurants for a bite to eat.